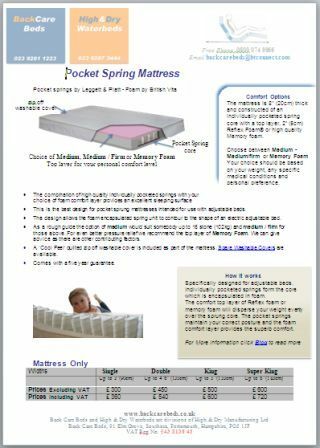 This blog is written to give additional advice and information relating to our ‘High Quality Pocket Spring Mattress‘ designed specifically for adjustable beds. Designed and constructed using the highest quality materials in order to overcome a problem. ‘What problem is that?’ I hear you ask. Use your imagination and visualize what happens when a pocket spring mattress is used on an adjustable bed. Take a conventional pocket spring mattress with standard height eight inch (20cm) springs all tightly compact and stood neatly in rows. No problem so far? Now have someone of average weight sit in the middle of the mattress. Still no problem? Now lift the head and foot ends to mimic the effect of an electric adjustable bed mechanism. Now we have a problem. Imagine how the springs interfere with each other as a result of the flex and compression and think how long the springs will last before they begin to sag. So what have we done to improve the mattress design to operate with an adjustable bed whilst maintaining the comfort support and life expectancy? The wire frame of a conventional pocket spring mattress would be ruined the first time the adjustable bed is raised. This is replaced by a completely flexible foam surround. The foam surround also acts as a seating edge and is also useful if mobility is an issue because it makes transferring from a wheel chair easier. The eight inch springs are reduced to four inches enabling them to flex better with less interference as the adjustable bed mechanism is raised and lowered. Comfort is improved by a two inch layer of specially developed Reflex foam, or if you prefer, you could opt for memory foam. I would like to say that this is the perfect solution but I can’t and neither can any other manufacturer (if they are honest). High & Dry Manufacturing Ltd have redesigned the mattress to work better with the adjustable bed. A fantastic design that gives excellent comfort but compromises have to be made to allow the mattress to flex. For this reason, although we feel this is the best adjustable bed pocket sprung mattress on the market, it is not our best mattress. For only £50 more (at the time of writing this) you could upgrade to a High Quality Memory Foam Mattress. We hope this information will not put you off selecting this mattress. As a manufacturing company we would prefer to give honest information and advice. So to summarize, this is an excellent quality mattress giving superb comfort but we doubt it will last as long as a high quality pocket sprung mattress that is not designed for adjustable beds. I should also mention that the mattress has a zip off washable cover. This entry was posted on Tuesday, October 18th, 2011 at 10:01 pm	and is filed under Adjustable Bed Mattresses. You can follow any responses to this entry through the RSS 2.0 feed. You can leave a response, or trackback from your own site.